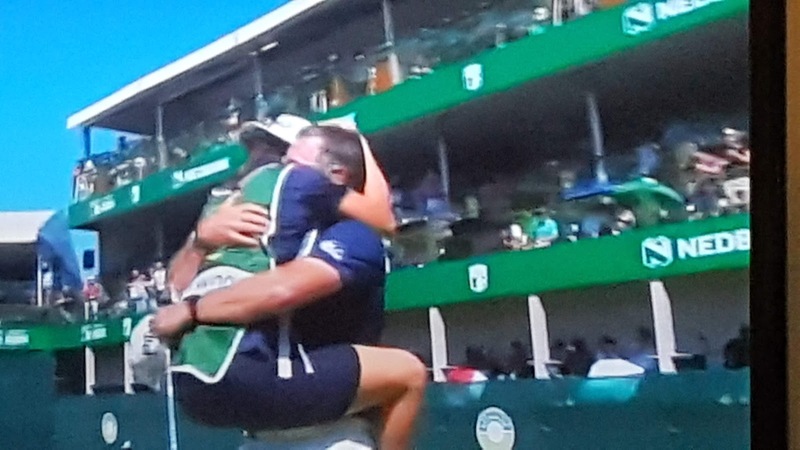 If Lee Westwood putting the lights out to win The Nedbank wasn't exciting enough for you; the ensuing celebration where caddie, and girlfriend (everybody calm down) Helen Storey, gave him the old Xenia Onatopp vs James Bond scissors strangle treatment from Goldeneye was pretty darn cool. God only knows how ugly it would have been if regular caddie Billy Foster had been there! Here's the only decent video I could find. Includes Pierce Brosnan doing the famous arse burn! In case you missed the highlights from the Nedbank here they are below. Lee Westwood hit 29 fairways around the tight Gary Player Country Club with his Ping G400 LST driver (T32 in the stat) averaging 317.8 yards. His Ping i210 irons however were on point finding 55 greens in regulation, 4th in the field. So often his Achilles Heel, this week the putts dropped. Westy's Ping Sigma 2 "Fetch" putter rolling in five crucial birdies (11, 13, 14, 16 and 17) in his final eight holes for 113 total putts and T14 in the field. A mention too must go to his Ping G400 fairway wood which helped accumulate a field topping -11 on the par-5's and proved decisive in helping Lee win to a third career win at the venue. His 24th European Tour win and 43rd victory worldwide now sees him jump 55 places to 64th in the latest World Golf Rankings and with this weeks Tour Championship to come, a chance to climb up amongst the world's elite beckons once again for Westwood. Driver: Ping G400 LST (10 degrees) with a Veylix Rome 60 X shaft. 3-wood: Ping G400 (14.5 degrees) with an Aldila Phenom 70X shaft. Hybrid: Ping G (19 degrees) with an Aldila ATX Tour Green 85X shaft. Irons: Ping i210 4-PW, UW's (50, 54 degrees) all with Ping JZ Stiff shafts. Wedges: Ping Glide Forged (60 degrees) with JZ Stiff shaft.